We’ve lost count of the number of articles on MOMS we’ve had declaring the need for a quintessential attacking-midfielder. In short, the team needs a player that can cause mayhem for the opposition in Zone 14. Zone 14 is one of 18 zones on the pitch which are calculated by dividing the field into a six-by-three grid (see above picture) and Zone 14 is the “golden square” on a football pitch that’s it’s been calculated where most teams can score the most goals from if they fully utilise its potential. The theory was developed by researchers at Liverpool John Moores University Research Institute for Sports and Exercise Sciences and now is a feature of top coaching courses. Professor Tom Reilly, who developed the theory, stated creative midfielders were best-suited to “cause havoc” in Zone 14. He said: “Some coaches are already aware of this zone, which they call The Hole, but our research has brought forward the understanding of how it works”. The research was done during the 1998 World Cup and 2000 Euros. The winners of both tournaments,France, possessed pretty much the master of ‘Zone 14’ in Zinedine Zidane. “Effective use of Zone 14 will sometimes end in a goal but often in a set piece,” said Reilly. “In a way that doesn’t matter as the majority of goals come from set pieces anyway. Aston Villa’s home game against Liverpool highlighted the problems they could face this season and the same issues have also contributed to their recent poor home form. From Martin O’Neil’s Villa team onwards, breaking teams down at Villa Park has always been a troubled science. Lambert’s 4-3-3 formation first of all sets out to nullify the opposition’s attacking potential in Zone 5 (the opponent’s Zone 14) with two deep-lying midfielders, normally in the shape of Delph and Westwood. Villa at times with their third midfielder in the form of Sylla or El Ahmadi struggle to even reach Zone 14 in the opposition’s half. Most attacking play is left to the front three to combine and forge their own openings, which with the pace and power of Benteke, Agbonlahor and Weimann suits away games with Villa’s proven success on the counter-attack. The idea of attacking with a modern 4-3-3 though is that, the third midfielder should link up with the front three when building possession and make a telling contribution in Zone 14. Without a truly dynamic attacking midfielder, as Villa found out to their cost at home last season (especially against Bradford City at Villa Park), slow methodical build-up play with frequent sideways and backwards passing, allows the opposition plenty of time to keep their shape and guard Zone 14. Liverpool’s Brendan Rodgers knew that Villa’s strength was on the counter and while Liverpool perhaps have a team to take the game to Villa, that would also leave Liverpool open and vulnerable to Villa’s most potent method of attack. That’s exactly what Rodgers did to Villa. By being cautious going forward by not committing too many players and also holding two disciplined and tight banks of players when Villa had possession, the speedy counter attacks of Benteke, Gabby and Weimann were nowhere to be seen. Rodgers had learnt his lesson well from Villa’s 3-1 win at Anfield. So what happens this season, if all teams set up like Liverpool did at Villa Park? Some won’t have the quality of personal that Liverpool had, but being well-organised is over half the battle. The key is Villa being able to ultilise and create in the space in front of the twin banks of four that most teams will employ is clearly being more effective in Zone 14. At the moment, as Lambert indicated in his meet-and-greet with the season ticket holders, either Weimann or Tonev could play the ‘Hole’ or ‘No.10’ position. But will they be enough? Weimann is more a creature of effort and instinct, rather than the clever and composed head that is needed to conjure in Zone 14. At the moment, Tonev is very much finding his feet and there is a rashness to his play, with the player preferring to have a pop on goal from distance, if the chance presents itself. Lambert knows he needs something extra in the position – as an earlier inquiry into Hiroshi Kiyotake indicates – but will he dip into the transfer window one final time, before it slams shut until the new year? The outcome may also affect the true effectiveness of Christian Benteke, who would no doubt benefit from a midfield creator. If the Belgian forward realistically has a season left with Villa, it’ll be worth striking while the iron’s hot to get the very best out of him. I certainly don’t see Weimann filling the role as he’s more of a poacher capable of feeding off a 9 or possibly a 10 ! ScottTrimble CraigWright You’re right there – we have zero chance of getting Barkley. I can’t think of any British player to fit this role to be honest. We coach flair out of players in the UK. Fine article with some excellent information. 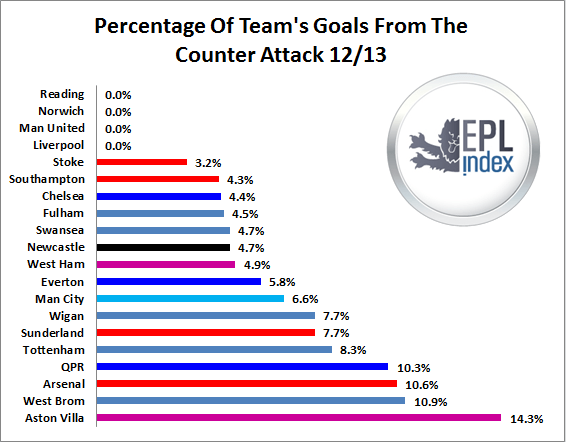 In simple terms – Villa have been soft in the middle for ever. It was the same under the false messiah. Not having a central player with guile wouldn’t be so bad if we had other players capable of beating their opponent and driving into the space behind them – but we don’t. We tend to look to pass. I have heard some say this 433 is our version of total football – like that of Barcelona – but watching Barca the other night – it struck me that while they keep possession and pass – the opposition do not press them much – and they don’t commit to press because every single one of the Barca players can dribble and jink and go past you at any time. And they don’t often look like a 433 – they shift and shape depending on the situation – and at times resemble a 2 5 3. Our players – whilst improving – don’t have that level of control. Our passes are too often loose – our first touches are too often heavy – leading to a loss of possession or to silly over committed challenges in non threatening areas (yes I’m talking about you Fabian). So while a quality playmaker with guile would be a welcome addition perhaps what is needed at Villa Park is a slightly different philosophy. Our 433 is not the way overcome teams that sit deep. If one side has had to overcome these deep defensive tactics it has to be Ferguson’s Manchester United. The old purple nosed sherry sniffer knew that to break the bus parkers he had to take control of midfield – and then penetrate them with pace and trickery to pull their defenders out of shape. Villa did not do enough of that last Saturday. Liverpool had one shot on target and that resulted in a goal. That the ball in was a bobbley flukey one is irrelevant. Once they scored it Liverpool knew that Villa’s 433 would struggle to break them if they sat deep. Sitting deep denies space – the one thing our 433 needs – and it needs space because our players are not the best at beating their opponents. We need space to be there already – then we exploit it. Weimann can run into space – Agbonlahor can speed into space – but neither can turn and beat a defender with guile. The sort of guile that creates panic – the sort of guile that pulls defenders out of position – the sort of guile that then creates space around your zone 14 – the very space we need to score. Villa against Liverpool at times had three players on the wing and only one in the box. There were three out there because we have to pass our way past defenders. Give me one on the wing and three in the box please – as long as the one out wide is fast and tricky and capable of leaving his opponent on his backside. It is all well and good giving it a ‘right good go’ but if Villa are to challenge the top teams we will need more than just a playmaking number 10 – we will need fast tricky players who can beat an opponent and cause chaos in opposition defences. And more – we need a variation of our system that allows us to take control of midfield when at home – to deny the opposition the space or chance to score – and to pull them about to create the space and chances so we can. CraigWright Agree, it’s been painfully obvious that we lack a true #10 for a long while, and I’ve been hoping for years that we’d pick one up. I hoped when Bannan first came up that he might become our guy, then hoped that N’Zogbia might step into that role. Lots of other Villa supporters seem to think Gardner could be that guy, but honestly, I haven’t seen it in him. This year, I had hoped that Bacuna or Tonev might do it, but so far unconvinced. But I watched the Everton – WBA game yesterday, and the Toffees young Ross Barkley is the man we want, though I’m sure they won’t part with him. What? They needed to study to reach that conclusion? What a waste of bloody money. Anyone who has played any sort of organised football could tell you where an AM does most damage. Zone 14 is just ‘in the hole’. And yes, it is an area where we have been weak since Merson packed his bags. MON never even attempted to play through the middle, Houllier probably realised we couldn’t play through the middle, and AM said ‘attack? what’s that mean?’. I’m hoping Tonev can improve and fill that spot. He was a bit raw against Liverpool, but he was popping up in the right sort of areas.